a manger :: tapas | .liveit.loveit.blogit. 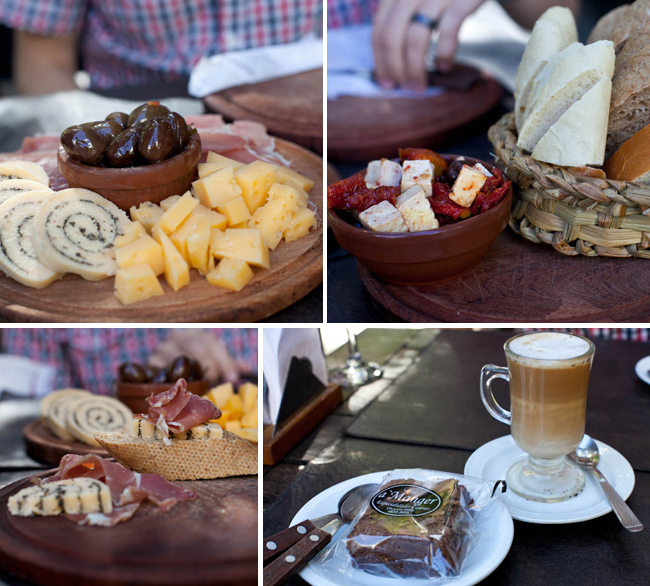 We walk down Malabia street in Palermo Soho several times a day. About a kilometre away from our apartment, at the corner of Malabia and Charcas is a Manger. A place that stops us in our tracks every time we walk by. On the Malabia side is a deli bursting at the seams with delicious looking mediterranean foods, on the Charcas side a tapas restaurant. It’s been on our list for months, but was only a couple of Fridays ago that we finally tried it out. The indoor section of this restaurant is quite small, and there are a handful of tables on the street. Inside features lots of wooden accents and is lined with wine bottles, outside features heavy wooden tables. Food is served on wooden plates, which is unique and kind of awesome. We were served quite quickly upon our arrival, but it took forever to get the server’s attention to order a coffee after the meal. The menu is thick and everything therein sounds delicious. I’m not entirely sure what we were thinking when we ordered a picada and a greek salad. The picada featured some cheeses, olives, and prosciutto, but we were already ham and cheesed out when we ordered it. I found it quite disappointing. While the prosciutto and olives were good, the cheeses weren’t anything to write home about. I did appreciate the selection of breads, however. The greek “salad” was a bowl full of sun dried tomatoes, olives, and feta cheese, which was not quite expected but was tasty. After lunch (when we finally got her attention) we ordered a capuccino and a brownie. At 6.25 ($1.50) for the brownie, I didn’t have particularly high hopes, and I would say it met my expectations. 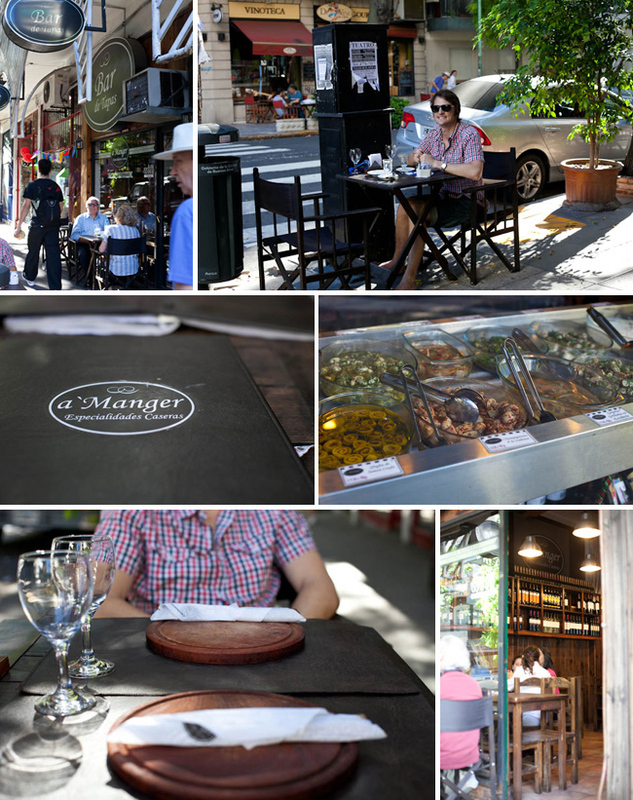 a Manger, Charcas 4001, Palermo Soho, Buenos Aires, Mon to Sat, 10 – 24. I’m having a really hard time thinking of the “bottom line” here. I was quite disappointed with the restaurant, but truly it may have been user error. Why would I order something I wasn’t in the mood for? I would give them another try, if only for the sandwich menu, which looked delicious!